Twenty years ago, life on Earth was wiped out. Now, the colonists on Mars scratch out a living in the husk of a once vibrant settlement. David Adler has survived by keeping a low profile. But when Mars’ lead engineer is murdered, Adler stumbles on a conspiracy to do away with life on the red planet. It's personal, so let me broadcast it across the internets. (Haha.) I went through a tough divorce, lost a job, became a single parent, and writing was a way for me to process the turmoil. 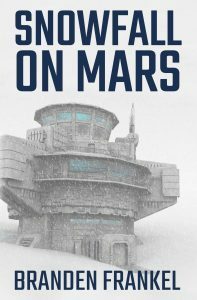 Snowfall on Mars is an allegory for that period in my life — a story of struggle and change and, ultimately, hope for the future. A few of them are based on people I know. The others arose more organically out of the story as it developed. I tried my best to see the situation from their perspectives to move the story forward and make it ring true. Lane’s mother, Gloria, took to an airlock the day after The End, Lane’s baby sister in her arms. This kind of thing — par-ents taking their children’s lives along with their own — was common in those days, a last act of parental discretion, I sup-pose. Lane was a toddler, and thankfully has no memory of the episode. Lane’s father contracted dysentery a few months later and died. I had already been relocated from Roosevelt Terminal at that point, and I knew Lane’s father in passing, having helped out at the colony’s hospital ward. Lane, along with most of his compatriots, was raised in one of the make-shift orphanages that sprung up as child after child was orphaned in rapid succession. The orphanages are gone now because there are so few young children left. Although nowadays there is the occasional pregnancy, such occurrences are exceedingly rare. Few people are cruel enough to want to bring a life into this world. Nobody has the resources or energy to care for a child. Most importantly, few women have the body fat reserves necessary to get pregnant. Life on Mars is aging, winding down like clockwork.